With the future program TOGETHER – Strategy 2025 announced in 2016, we aim to make the Volkswagen Group more focused, efficient, innovative, customer-oriented and sustainable, and systematically geared towards generating profitable growth. The program creates the framework and lays the cornerstones for us to achieve our vision of being one of the world’s leading providers of sustainable mobility. The time horizon until 2025 shows that our thoughts and actions are long-term and future-oriented. The term TOGETHER describes the mindset that will be even more vital to the Volkswagen Group’s long-term success going forward. Our intention with the new Group strategy is for everyone in the Volkswagen Group to join us in producing exciting vehicles and forward-looking, tailor-made mobility solutions that will continue to inspire our customers, meeting their diverse needs with a portfolio of strong brands. Every day, we actively assume and exercise responsibility in relation to the environment, safety and society, and we wish to be a role model in these areas. Integrity, reliability, quality and passion thus form the basis for our work. 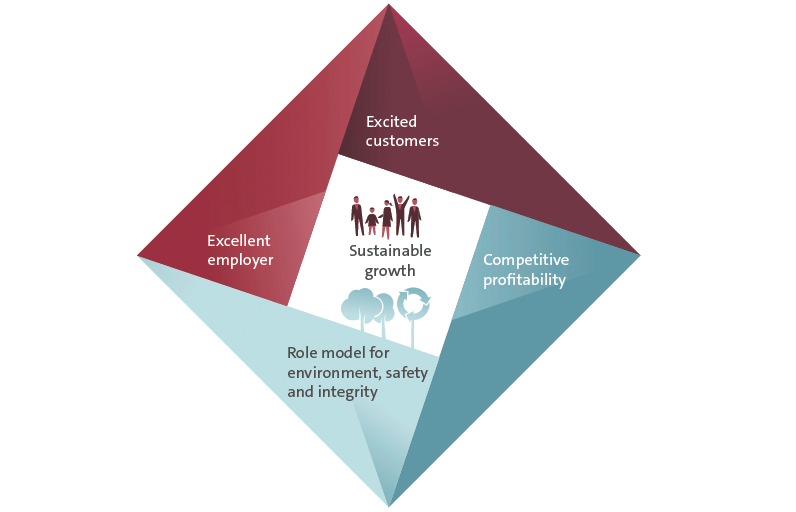 In this way, we will aim for technological leadership in the industry, ensure our competitive profitability and remain an excellent, reliable and secure employer at the same time. The Code of Collaboration formulated as part of the future program is the foundation on which the Group strategy rests. This Code describes how collaboration is to take place within the Group and between individuals in their day-to-day work. Its core values are encapsulated in the terms “genuine”, “straightforward”, “open-minded”, “as equals” and “united”.